Claire Hughes asks what matters and why. Alongside the birth of a sibling, the transition to school is the first major event in many children’s lives. This period is, for most children, exciting and enjoyable but it also brings social, practical and academic demands that some find challenging. Longitudinal studies confirm the importance of individual differences in early school success, but explanations remain elusive. Challenges include the lack of consensus about how ‘school readiness’ should be defined, the dearth of simple measurement tools, and difficulties in making causal inferences about family influences on children’s development. Nonetheless, recent years have seen progress in research, leading to interventions that could narrow the achievement gap between children from affluent and disadvantaged families. ‘School readiness’ is a term that means different things to different people. For politicians and many parents, school readiness hinges on achieving foundation skills in literacy and numeracy (Barbarin et al., 2008). Teachers, however, are more likely to highlight the importance of children’s behaviour and socio-emotional development. For example, in a USA survey of more than 3500 kindergarten teachers, respondents reported adjustment problems in half or more of their class (Rimm-Kaufman et al., 2000). Confirming the validity of these teachers’ concerns, robust links have been reported between preschoolers’ control of attention and behaviour and key long-term outcomes, including academic achievement (e.g. McClelland et al., 2013). Defining school readiness is also complicated by the fact that learning takes many forms: from surface learning (e.g. letter recognition) to deep learning (e.g. problem solving). Reflecting this heterogeneity, the UK Department of Education has issued Foundation Stage Goals that encompass both ‘Areas of Learning’ (e.g. literacy, numeracy) and ‘Characteristics of Effective Learning’ (e.g. self-regulatory and social skills, motivation to learn). Likewise, Blair and Diamond (2008) have argued that effective learning depends not only on cognitive skills but also on the physiological systems involved in adaptive responses to stress. 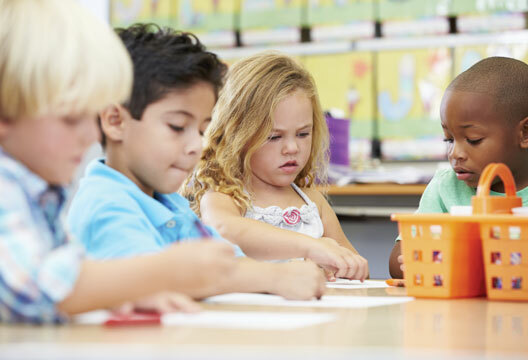 Extending this multi-layered approach upwards, other theorists have noted that academic achievement is linked to variation in children’s beliefs – for example, about whether intelligence is fixed or malleable. That is, children who believe that they can, through effort, improve their performance on a task will be more motivated to persist in their efforts or to try out different strategies. Finally, it is worth noting that the very term ‘school readiness’ can be seen as intrinsically unfair, in that it appears to place the burden of responsibility for success in the transition to school on the child. Given the social inequalities in many societies, assessing whether or not a child is ‘school ready’ is, arguably, a myopic exercise. Instead, leading theorists have recently proposed an interactive model in which families, schools and communities share a joint responsibility for children’s school readiness (e.g. Williford et al., 2013). From this perspective, the definition of school readiness should encompass not only children’s ability to meet everyday social and practical challenges but also key aspects of social support (which I will discuss later). In the past, school readiness has been assessed via detailed psychometric tests of specific pivotal cognitive skills. Adopting this traditional approach, this autumn the UK government will ask Reception teachers to complete a ‘base-line assessment’ for every child within the first few weeks of school (2015 is a pilot year; the plan is for these tests to become mandatory in 2016). Understandably, teachers have voted to boycott this mass testing of four-year-olds; likewise, many famous children’s authors have signed an open letter of protest, arguing that children in the UK already face too many tests and that four-year-olds are just too young to be assessed. From a psychologist’s perspective one might also add that formal psychometric assessments do not capture problems of behaviour and emotion regulation, which are increasingly recognised as key barriers to school readiness. So do we have more promising alternative strategies? Experimental measures of children’s socio-cognitive skills could be used to predict success at school. Two aspects of children’s socio-cognitive development that show striking individual differences are: (a) ‘theory of mind’ (with a particular focus on children’s understanding of the fallible nature of beliefs); and (b) ‘executive functions’ (the higher-order cognitive processes such as working memory and inhibitory control that underpin flexible goal-directed behaviour). Importantly, theory-of-mind tasks involve brief and engaging puppet stories, and so are quite different from formal tests. Unlike the large body of research on the social origins of individual differences in theory of mind (for a review, see Hughes and Devine, 2015) research on social and academic consequences is much more recent. In a meta-analytic review, Slaughter et al. (2015) found an overall link between theory of mind and peer status, which was clearer for positive measures (e.g. popularity) than for negative measures (e.g. rejection) and significantly stronger in girls than in boys – perhaps reflecting early gender differences in intimacy within friendship. Other recent studies have focused on potential mediators of the association between theory of mind and academic achievement. For example, in a study of Italian children, Lecce et al. (2011) found sensitivity to teacher criticism at age 10 mediated the association between age-9 theory of mind and age-11 academic achievement. Other findings from this Italian research group highlight both the importance of theory of mind for children’s meta-knowledge about reading (Lecce et al., 2010) and the scope for achieving sustained improvements in 9-year-olds’ understanding of mind through a school-based training programme involving group discussions about story characters and their motivations, thoughts and feelings (Lecce et al., 2014). These findings have real practical implications in that acquiring a theory of mind is likely to foster school success via multiple pathways, both direct (e.g. being able to understand teachers’ and peers’ intentions and so respond appropriately to instructions/social overtures) and indirect (e.g. forming and maintaining friendships that promote wellbeing and school engagement) (Hughes, 2011). Variation in theory of mind is closely related to individual differences in executive function (for a meta-analysis, see Devine & Hughes, 2014), which are also very important for children’s success in the transition to primary school (Hughes & Ensor, 2011; Hughes et al., 2010). Children draw on their executive functions when they are required to: (a) hold information (e.g. teachers’ instructions) in mind; (b) resist distraction (e.g. from peers); (c) inhibit impulsive responses (e.g. calling out or grabbing); or (d) switch goals (e.g. from playing to tidying up). These key components of executive function show contrasting developmental trajectories; as a result, efforts to identify their relative salience for school success have so far produced mixed findings. Although there is no single ‘litmus test’ of executive function (to parallel the false-belief task that is so widely used in theory-of-mind research), one engaging and cheap (no materials required) multi-componential test is the Heads-Toes-Knees-Shoulders task (HTKS), which is akin to the children’s party game ‘Simon Says’. Performance on the HTKS in kindergarten predicts academic gains across the transition to formal schooling, especially in mathematics (McClelland et al., 2014). However, much more research is needed to establish causal pathways and identify the specific mechanisms through which executive functions can promote school readiness. Children who make greater gains in executive control across the transition to school display more positive academic self-concepts (Hughes & Ensor, 2011), which in turn are known to play an independent role in predicting individual differences in achievement (Paunesku et al., 2015). Poor executive function in preschool is also a robust predictor of problem behaviours (for a meta-analysis, see Schoemaker et al., 2013). Thus, in addition to direct effects, gains in executive control are likely to benefit children’s academic performance through both an increased motivation to learn and more positive interactions with peers. An obvious alternative to testing children’s socio-cognitive skills directly is to harness the skills and experience of teachers to identify children who lag behind their peers in the keycomponents of school readiness. Adopting this strategy, a Canadian research team (Janus & Offord, 2007) developed the Early Development Instrument (EDI) to enable teachers to monitor preschool children’s developmental health and wellbeing in five distinct subscales (social, emotional, physical, cognitive and communicative ability). The EDI has been used in epidemiological studies of four- and five-year-olds in several different countries. For example, an adapted version of the EDI was used in a national census of 261,147 Australian five-year-olds (i.e. 97 per cent of all five-year-olds in the population), which revealed worrying regional disparities in the proportion of children with ‘developmental vulnerabilities’ (Brinkman et al., 2014). Although the EDI is clearly a useful instrument, three limitations deserve note. First, the EDI does not include any items about family support and so provides only a partial view of school readiness. Second, the EDI was developed for Canadian children who start school between the ages of five and six and so is not really developmentally appropriate for children in the UK who typically enter an educational setting at three years of age, with some receiving government vouchers to attend preschool from as early as two years of age. Third, at seven pages (104 items) long, the EDI would take a teacher many hours to complete for a class of 30 children; time that would probably be much better spent in helping children to settle in. In response to the above challenges, my research team and I have developed a one-page questionnaire – the Brief Early Skills and Support Index (BESSI), for educators working with children aged 2.5 to 5.5 years (Hughes et al., 2015). The BESSI encompasses not only traditional aspects of school readiness but also items about salient ‘daily living skills’ for younger children (e.g. independence in dressing/using cutlery/personal hygiene) and indicators of family support (attendance, punctuality, sleepiness, regular reading, receiving praise and fun at home). These items were identified through focus groups with teachers, conducted to ensure that the BESSI had good face-validity for informants. Teachers’ ratings for just under 1500 children revealed three latent child factors (behavioural adjustment, language/cognition and daily living skills) and one family support factor. The BESSI can be used reliably from 2.5 to 5.5 years and does not show any age-related bias. For each of the four BESSI subscales, problems were, on average, about twice as likely in boys as in girls and in children from low-income families (defined by eligibility for the pupil premium) as compared with their more affluent peers. Overall then, the BESSI appears to provide a promising brief alternative to the EDI. The BESSI study described above yielded two interesting sets of findings concerning family support. First, the poorer outcomes noted for children from low-income families were explaine by contrasts in family support. Of the six family support items, two (‘talks about fun activities at home’ and ‘reads regularly at home’) showed particularly strong correlations (.51 and .34 respectively) with scores for Language/Cognition – the traditional ‘core’ measure of school readiness. Home reading is well recognised as important for children’s success at school, but the strong links with ratings for ‘fun at home’ are novel and encouraging, in that they indicate that parents who do not enjoy reading can nevertheless contribute to their children’s school readiness – simply by spending time and having fun together. Variation in family support also differed by gender and birth order. Compared with girls and with first-born children respectively, family support ratings were, on average, lower for boys and for children with an older sibling. Worryingly, the strongest gender difference was for the item ‘talks about fun activities at home’ that, as noted above, was an especially strong predictor of positive child outcomes. The birth-order effect is also of concern: while the need to support adults making the transition to parenthood is well recognised, this contrast highlights the importance of supporting parents who face the additional challenges that come with caring for more than one child. Findings from other large-scale studies support the results of this BESSI study. For example, an NICHD study of 1300 children followed from birth provides further evidence that the quality (as much as the content) of parent–child interactions matters for children’s school readiness (Allhusen et al., 2003). Specifically, both maternal sensitivity in late-preschool and increases in maternal sensitivity from infancy to preschool predicted greater social competence, fewer problem behaviours and reduced conflict with adults – positive outcomes that are likely to contribute to school readiness. Further findings from this NICHD cohort showed that attachment security at 24 and 36 months predicted IQ and school performance in middle childhood, with parental quality of assistance and support for homework (alongside children's self-regulatory skills and social relationships) playing a mediating role in these predictive relationships (West et al., 2013). Parents are particularly well placed to use scaffolding in this way to set their children upon a positive journey to learning: for example, providing the appropriate form and level of support is much easier if one knows a child well; moreover, parents are not only children’s ‘first teachers’ but also the people who matter most to them, such that parental praise and encouragement is particularly powerful. Parental cognitions also matter: children’s achievements are often more clearly related to parental views of their ability than to their previous actual performance (e.g. Jacobs & Weisz, 1994). It is, however, important to avoid simplifications. For example, parental support for early literacy requires not only a belief in the value of reading and in the child’s ability and interest, but also both a recognition of the importance of making reading fun (Sonnenschein et al., 1997) and a sense of their own efficacy as parents (for a review, see Jones & Prinz, 2005). This complex network of influence makes it difficult to draw causal conclusions about family influences on school readiness. In addition, beyond the obvious challenge of distinguishing effects of nature and nurture, children vary markedly in their susceptibility to parental influences (Belsky et al., 2007). Perhaps the most fundamental problem, however, is the non-linearity of parental effects. In some ways, this can be explained by the psychoanalytic construct of ‘good enough’ parenting (Winnicott, 1953). That is, rather like gardeners, parents need to tend their infants with patience, attention and care, but should not expect success at every turn. Applying this gardening metaphor to the transition to school, one could argue that just as good gardeners allow seedlings to harden off before moving them from the greenhouse to the soil, so too good parents provide children with gradually increasing autonomy and responsibility for decision making and emotional regulation. In other words, ‘more parenting’ does not necessarily equal ‘better parenting’. As a result, while the contrast between poor versus adequate parenting is vitally important, beyond the threshold of ‘good enough’ parenting variation in parenting quality often only has very modest effects (Scarr, 2000). Social mobility in the UK has dropped dramatically and is now on a par with the USA and lower than in Canada, Germany and Scandinavia (Blanden et al., 2005). Pivotal to this problem of social immobility are contrasts in educational aspirations and achievement (e.g. Engle & Black, 2008). Many sources of stimulation for children are free (e.g. public libraries, parent-toddler groups), but parents living in poverty may well lack the confidence or motivation needed to take advantage of these resources (particularly if this requires transport). Family chaos is another salient index of adversity that has been shown to predict unique variance in early reading (Johnson et al., 2008). Twin findings demonstrate that genetic factors underpin one third of the association between family chaos and poor school performance (Hanscombe et al., 2011). In other words, most of this association is environmental; moreover, in a recent Early Head Start study both resilience and cognitive development in preschoolers was enhanced by fostering family routines (Ferretti & Bub, 2014). - From adversity to buoyancy: Marc Smith reconceptualises resilience in schools. - New voices: Do schools need lessons on motivation? Allhusen, V., Belsky, J., Booth, C. et al. (2003). Early child care and mother-child interaction from 36 months through first grade. Infant Behavior and Development, 26(3), 345–370. Barbarin, O.A., Early, D., Clifford, R. et al. (2008). Parental conceptions of school readiness. Early Education and Development, 19(5), 671–701. Belsky, J., Bakermans-Kranenburg, M. & Van IJzendoorn, M. (2007). For better and for worse. Current Directions in Psychological Science, 16, 300–304. Blair, C. & Diamond, A. (2008). Biological processes in prevention and intervention. Development and Psychopathology, 20, 899–911. Blair, C. & Raver, C. (2014). Closing the achievement gap through modification of neurocognitive and neuroendocrine function. PLoS ONE, 9, art. no. e112393. Blanden, J., Gregg, P. & Machin, S. (2005). Intergenerational mobility in Europe and North America. A report supported by the Sutton Trust: Centre for Economic Performance, London School of Economics. Brinkman, S. A., Gregory, T. A., Goldfeld, S. et al. (2014). Data resource profile: The Australian Early Development Index (AEDI). International Journal of Epidemiology, 43(4), 1089–1096. Devine, R. & Hughes, C. (2014). Relations between false-belief understanding and executive function in early childhood: A meta-analysis. Child Development, 85, 1777–1794. Engle, P.L. & Black, M.M. (2008). The effect of poverty on development and educational outcomes. Vol. 1136. Annals of the New York Academy of Sciences (pp. 243-256). Ferretti, L. & Bub, K. (2014). The influence of family routines on the resilience of low-income preschoolers. Journal of Applied Developmental Psychology, 35, 168–180. Hanscombe, K., Howarth, C., Davis, O. et al. (2011). Chaotic homes and school achievement. Journal of Child Psych and Psychiatry, 52, 1212–1220. Hughes, C. (2011). Social understanding, social lives. London: Psychology Press. Hughes, C. & Devine, R. (2015). A social perspective on theory of mind. In M. Lamb (Ed.) Handbook of child psychology and developmental science: Vol. 3. Socioemotional processes (pp.–46). New York: Wiley. Hughes, C. & Ensor, R. (2011). Executive function trajectories across the transition to school. Journal of Experimental Child Psychology, 108, 663–676. Hughes, C., Ensor, R., Wilson, A. & Graham, A. (2010). Tracking executive function across the transition to school. Developmental Neuropsychology, 35, 20–36. Hughes, C., Roman, G. & Ensor, R. (Eds.) (2014). Parenting and executive function (Vol. 1). Wiley. Jacobs, J.E. & Weisz, V. (1994). Gender stereotypes. Roeper Review, 16, 152–155. Janus, M. & Offord, D.R. (2007). Development and psychometric properties of the Early Development Instrument (EDI). Canadian Journal of Behavioural Science, 39(1), 1–22. Johnson, A., Martin, A., Brooks-Gunn, J. & Petrill, S. (2008). Order in the house! Merrill-Palmer Quarterly, 54, 445–472. Jones, T.L. & Prinz, R.J. (2005). Potential roles of parental self-efficacy in parent and child adjustment. Clinical Psychology Review, 25, 341–363. Lecce, S., Bianco, F., Devine, R. et al. (2014). Promoting theory of mind during middle childhood. Journal of Experimental Child Psych, 126, 52-67. Lecce, S., Caputi, M. & Hughes, C. (2011). Does sensitivity to criticism mediate the relationship between theory of mind and academic achievement? Journal of Experimental Child Psychology, 110(3), 313–331. Lecce, S., Zocchi, S., Pagnin, A. et al. (2010). Reading minds. Child Development, 81, 1876–1893. Mashburn, A.J. & Pianta, R.C. (2006). Social relationships and school readiness. Early Education and Development, 17, 151–176. McClelland, M.M., Acock, A.C., Piccinin, A. et al. (2013). Relations between preschool attention span-persistence and age 25 educational outcomes. Early Childhood Research Quarterly, 28, 314–324. McClelland, M., Cameron, C., Duncan, R. et al. (2014). Predictors of early growth in academic achievement. Frontiers in Psychology, 5, art. no. 599. Melhuish, E., Belsky, J., Anning, A. et al. (2007). Variation in community intervention programmes and consequences for children and families. Journal of Child Psychology and Psychiatry and Allied Disciplines, 48(6), 543–551. Paunesku, D., Walton, G., Romero, C. et al. (2015). Mind-set interventions are a scalable treatment for academic underachievement. Psychological Science, 26, 784–793. Rimm-Kaufman, S., Pianta, R. & Cox, M. (2000). Teachers’ judgements of problems in the transition to kindergarten. Early Childhood Research Quarterly, 15, 146–166. Scarr, S. (2000). American childcare today. In A. Slater & D. Muir (Eds.) Blackwell reader in developmental psychology. Oxford: Blackwell. Schoemaker, K., Mulder, H., Deković, M. & Matthys, W. (2013). Executive functions in preschool children with externalizing behavior problems: A meta-analysis. Journal of Abnormal Child Psychology, 41, 457–471. Slaughter, V., Imuta, K., Peterson, C. & Henry, J. (2015). Meta-analysis of theory of mind and peer popularity in the preschool and early school years. Child Development, 86 (4), 1159–1174. Sonnenschein, S., Baker, L., Serpell, R. et al. (1997). Parental beliefs about ways to help children learn to read. Early Child Dev and Care, 111–118. West, K.K., Mathews, B.L. & Kerns, K.A. (2013). Mother-child attachment and cognitive performance in middle childhood. Early Childhood Research Quarterly, 28, 259-270. Winnicott, D. (1953). Transitional objects and transitional phenomena. International Journal of Psychoanalysis, 34, 89–97.